Bill Murray put in the time to make not just one but two Garfield movies, and now it's acting veteran Kevin Spacey's turn to be the voice of a CGI cat in Nine Lives, a new family comedy from Men in Black director Barry Sonnenfeld. 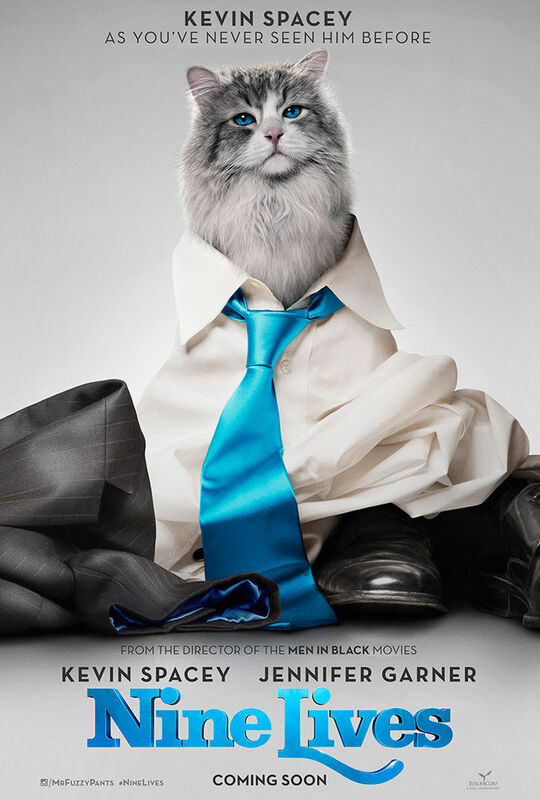 Also starring Jennifer Garner and The Flash's Robbie Amell, Nine Lives casts Spacey as Tom Brand, a billionaire businessman who is trapped in the body of a cat by pet store owner Felix Grant (Christopher Walken). The aim of the cat exercise is to force Tom to better appreciate the family that he's been ignoring in favor of his business pursuits. By adopting his new persona, and in turn being adopted by his family, Tom gets to spend more time with his wife and kids while also getting up to crazy kitty hijinks. The workaholic father trope is one that we've seen many times before in movies like Liar Liar, Jingle All the Way, and Click (the latter of which also starred Walken as the crazy character who comes up with the dose of magical realism to save the main character's family life) but apparently Hollywood isn't quite done with it yet. If that synopsis hasn't sold you on Nine Lives already, we also have the first teaser trailer and poster for the movie. In the teaser, Kevin Spacey a.k.a. Mr. Fuzzypants falls out of a window, has an accident with a box of cereal, gets a bow forcibly put in his hair, and begs his young daughter to drown him - but in a fun way. Also, Walken's character says that the punishment is perfect without pronouncing the word as "purr-fect," which we should all be grateful for. There have been a lot of grumpy cat movies - in fact, in 2014 there literally was a Grumpy Cat movie - but Sonnenfeld's name still holds some sway, and it's worth remembering that the two Garfield movies were reasonably successful despite not being major hits. In any case, let's hope that Nine Lives turns out to be more on par with Men in Black or The Addams Family than Wild Wild West. It is nice to see Spacey using his off-time between seasons of Netflix's critically-acclaimed political drama House of Cards to do something very, very different. And while it might be difficult to get too optimistic about Nine Lives based on this teaser, at least in ten years we'll all be able to look back and say to one another, "Hey, do you remember that time Kevin Spacey was a cat?" Nine Lives arrives in theaters on August 5th, 2016.